Basa with Lemon Rind / Basa Jhuri is a simple and handy recipe. Thanks to Shanta Auntee. 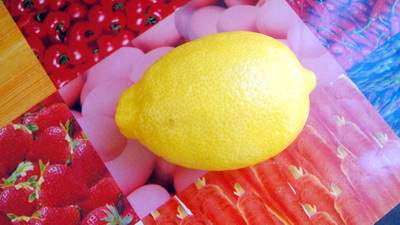 I want to keep the flavour of lemon so I haven’t used coriander leaves. but you want , you can add coriander leaves in the end. 1. Cut basa like the picture. 2. Heat the pan with oil and add onion. Cook onion till it becomes soft. 3. Add all spices and salt and cook till oil is separated. 4. 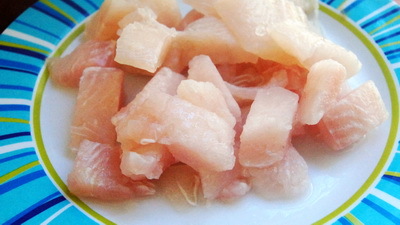 Add fish and 2/3 of lemon rind and stir well. 5. Cook till all ingredients comes along together an add rest of rind. 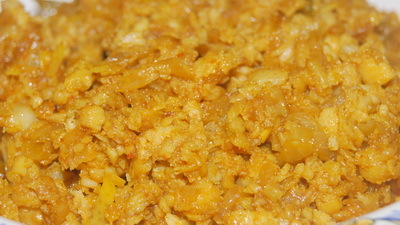 Stir well to make crumble (jhuri) texture. 6. After 1minute check salt and remove from heat. 7. Serve Basa with Lemon Rind / Basa Jhuri with plain rice.